Held at the University of Houston Hilton Hotel and Conference center. See the Houston History Conference website for more details. Learn how to use the free, online website, Billion Graves. Billion Graves has been described as the, “fastest, easiest and most efficient way to gather headstone data in the world”. Also discussed will be how you can become a volunteer and add even more data. Reservations required. Please call 832-393-2600. Adults/Teens. Ever thought about volunteering, but you can’t come to the library? Maybe your time is short and you just can’t commit to a certain time each week, but you still want to help. Are you interested in old records? Are you interested in various types of records? Do you use the computer? It sounds like “indexing” might be just the right volunteering project for you. Come hear from an experienced indexer/arbitrator about the thrills of indexing. Bring a laptop if you have one and get started today or practice in the library on one of ours. Reservations required. Please call 832-393-2600. Adults/Teens. Learn about the vast resources and how to efficiently utilize genealogical research materials housed at the Clayton Library Center for Genealogical Research. No reservations needed, meet at the Information Desk in the library. Adults/Teens. Your chance to research at the Library at the Alamo, which is in downtown San Antonio within walking distance of the Riverwalk. All information is available on the registration flyer. You must register by June 13. CGS meetings are open to the public. They are held in the second floor meeting room of Amegy Bank (formerly Klein Bank), located at 28201 Business 249 at Medical Complex Drive in Tomball. Speaker Jennifer Ross-Nazzal, Ph.D., Historian at NASA's Johnson Space Center, discusses the life of suffragist Emma Smith DeVoe. See the BAGS website for more information. Looking to join the United Daughters of the Confederacy, Daughters of the American Revolution, or Daughters of the Republic of Texas? Come to Clayton Library on Wednesday nights from 5:30 to 7:30. Members of the Oran M. Roberts Chapter UDC #440 are here to help you discuss your lineage application research. This is available MOST Wednesday nights, but call 832-393-2600 to confirm the team will be here. Sign up when you get to the library. Adults/Teens. Please contact these groups if you have any questions about their events. Do you have a local or regional genealogy event you would like to publicize? Let me know and I'll put it on the list. Cajun by Any Other Name* focuses on the history of one person’s Acadian, Native American and European ancestral lines. Author Marie Rundquist shares the relocation and establishment of her ancestors from Canada to Louisiana. The book is organized into six chapters. Five of the six chapters detail distinct eras in the location of the author’s ancestors. The first chapter details the relocation of Rundquist’s ancestors from Nova Scotia to Maryland’s Eastern Shore. The author’s description of their plight and the setting make a good read for those unfamiliar with the area’s history. This section itself would make an excellent book on the topic of Acadian exile in Maryland. The middle chapters of Cajun by Any Other Name focus specifically on the authors own ancestors as they made their way to Louisiana. Rundquist moves back and forth between her ancestors’ past and her own story in the present day including detailed travel itineraries and commentary. This works most of the time but occasionally takes away from the historical narrative. Chapter six is titled “Out of Acadia,” but it actually is a discussion on the use of DNA tests in genealogy. Here the book shifts unexpectedly from the focus on history as the author discusses her own experiences with DNA and shares those of others who are in her same research interest group. Those who are not familiar with DNA tests as they are used in family history may be confused by this chapter, as there is no introductory lesson on haplogroups and Y-DNA and mt-DNA. This final section--like the first chapter--would make an interesting book topic in itself. The book includes several color photos and references at the end including a healthy bibliography. There is no name index, though the author’s maternal ancestral line is provided for reference as an appendix. Cajun by Any Other Name is most relevant to those who share common Acadian ancestry with the author. Though my own Cajun roots landed and grew further west in Louisiana, I still found Rundquist’s ancestral story to be an interesting read. The 2012 Southern California Genealogy Jamboree is almost here! Below is a list of bloggers and attendees who have Twitter accounts and will be the 2012 SCGS Jamboree. Follow them for networking, or if you're at home follow them for live coverage of Jamboree. Use the hashtag #scgs12. If you're going to the 2012 Jamboree, have a Twitter handle and are not on this list, let me know in the comments below and I will see that you're included. Thanks! Below is a list of 2012 SCGS Jamboree speakers who have individual Twitter handles, or actively manage their own Twitter business handles. If you're on Twitter, be sure to follow these folks so you don't miss a minute of the action. Use hashtag #scgs12 when talking about Jamboree or if you are following along at home. Are you a 2012 Jamboree speaker/Twitter user who is not on the list? Do you know of someone who should be on the list? Leave a comment on this post and I will make additions to this list. Thanks! Below is a list of vendors and sponsors who have Twitter accounts, as well a hand, a table, or a booth at the 2012 SCGS Jamboree. Also don't forget to follow @scgsgenealogy, as they're the ones who put on this great event each year. Please note that this is not a list of ALL the vendors and sponsors at Jamboree. These are the ones who have Twitter accounts. Vendors with Twitter accounts: use them. We want to visit you at Jamboree. We want to spend money and tell others about your products. We want to learn about prizes, drawings, product demonstrations and/or Elvis sightings via our Twitter feeds. Interact with us before, during and after the conference. I really wasn't kidding about the "we want to give you money" part. If I am missing any vendors here, let me know in the comments below and I'll add you to the list. Thanks! --Amy (@acoffin). The world of genealogy is changing at an ever-increasing rate through the development of new technologies. Millions of people are passionate about discovering their roots. They share an interest in learning about the latest technologies and methods to help them in this pursuit. The third annual RootsTech Conference brings together thought leaders and consumers who want to share and experience the latest trends in genealogy and technology. 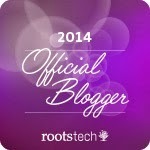 Building on the success and growth of previous years, RootsTech 2013 will reach thousands of participants on site and around the world. RootsTech includes engaging, interactive sessions that promote learning and the free exchange of ideas on improving the way genealogy is done. Genealogists and technologists attending this conference share a stance that is progressive and forward thinking. They are interested in the application of technology to simplify and improve the family history experience. Unique tracks will be offered that address the specific needs of genealogists and technologists, with an emphasis on how they can more effectively work together. We invite proposals that address technology challenges and solutions that have the potential to improve family history and genealogical research. Additional consideration will be given to proposals that provide hands-on or interactive experiences, with presenters giving step-by-step approaches and live demonstrations for using technology for genealogy, including tips and helps for using software, hardware, standards, APIs, plug-ins, etc. Since RootsTech is designed as an interactive conference, traditional lectures depending entirely on text-based slides are discouraged. Submissions are due by June 15, 2012, with an extended deadline of October 15, 2012 for limited, late-breaking technology research submissions. Presentations: Classroom settings that engage participants. Panels or Discussions: Formal panels of experts discussing specific topics, led by a facilitator. Hands-on Workshops: Labs where attendees have hands-on experience in a specific task or objective. Unconferencing: Informal, participant-led discussion groups. Proposals will be accepted online at rootstech.org from May 9, 2012 through June 15, 2012. Syllabus materials will be due from participating presenters on October 1, 2012 (other than late-breaking proposals). Presenters participating in the RootsTech Conference will receive a complimentary conference registration and a syllabus. There is no monetary compensation for presenters at this conference. Out-of-state speakers selected to present three or more lectures will also receive hotel accommodations. Once a week I drive across town and scan someone else's stuff. This week when I got there I pulled a giant folder of letters out of the drawer. Within all the letters was this stack of about 120 index cards. They were regular lined 3x5 index cards. Nothing special, but each one had one or two sentences written in pencil on it. All were undated and included no names. After reading a few of the cards, I realized that they were love notes from the WWII soldier man to his wife. Judging from the information on the cards, I'd say they were written after the war when the two were back in the same house. What touched me was that each card was a love note. Perhaps the man left a card every day for his wife to read after he left for work. Each card was kind or funny, but all of them told this lady how much her husband loved her. And boy did he love her. I was floored that no two cards were the same, yet each one was sincere. How many different ways can you say you love someone? This guy did it 120 different ways. How would marriages change if we all did something like this? 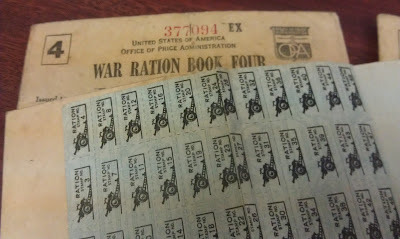 Once the cards were done, I scanned a bunch of World War II era letters to and from the man and wife. Many from the man were short notes written quickly before bed. He was very busy in the military. Some of the letters deal with basic marital issues like getting the taxes filed, which is a challenge when the guy who does the taxes is serving the country. My favorite letter of the day was to the wife from the wife's sister. The wife had a new baby and the sister was giving her parenting advice. Was the baby on orange juice yet? It was time to put the baby on orange juice. And cod liver oil. Do not forget the cod liver oil. It says so on page 76 of the parenting book. When I read that, I turned the letter back over, looked at the date, and did the math in my head. The baby was a month old! Ay yi yi. I'll steer clear of 1940's parenting advice. So that's it for this week's scanning. I had no idea so many people read this series and actually liked it. Thank you for the feedback and encouragement. This is my 3x5 index card to you. The 2012 Southern California Genealogical Society Jamboree is approaching fast. SCGS has instituted a youth scholarship program for aspiring genealogists from 18-29. This makes conference attendance very affordable for students and young whippersnappers. Geneabloggers has a list of bloggers who will be at Jamboree. Follow them for all the latest Jamboree information. Did you know that Jamboree has its own blog? Check it often for Jamboree updates before and during the conference. [Last November I had lunch with the kind folks at 1000memories. They asked for my input on their new ShoeBox app for the iPhone. I pulled my Android phone out of my pocket and set it on the table. They got the message. Photo-scanning app unveils new design; adds the ability to organize photos into digital shoeboxes. SAN FRANCISCO, May 9, 2012 — Building on the popularity of its mobile photo-scanning app, 1000memories today launched ShoeBox for Android as well as a completely redesigned version for iPhone. ShoeBox, which debuted for iPhone in October 2011, is the first mobile tool designed for digitizing and sharing photos from the past. Following its launch, ShoeBox grew to reach top 3 free apps in the photography category and top 2 in the family history category. The app gives individuals, families and organizations the ability to quickly scan and instantly share photos that have previously been difficult to digitize. ShoeBox can auto-detect the edges of a photo and then quickly crop and straighten accordingly. Users can then add information typically written on the back of old photos - such as dates, names, and locations. In today’s release, 1000memories also introduced its popular “shoeboxes” organization tool on the Android and iPhone apps. Users can now seamlessly organize scans into different collections and instantly share them with the right people using their mobile devices and the website. While often considered people’s most valuable possessions, old family photos and albums are traditionally neglected in shoeboxes, old albums or archived analog collections. 1000memories hopes to breathe new life into the photos from the past by making it easy to preserve and share them with the right people. 1000memories makes the new shoebox for your old photos. Founded in 2010 in San Francisco, California, 1000memories is a free website recently featured in Oprah Magazine that helps families and friends share long-forgotten photos sitting in old albums and hard drives. For more information, visit 1000memories.com. James Harkins of the General Land Office of Texas will be the speaker at the meeting. Registration will start at 10:15 at the Carriage House and the meeting will begin at 10:30. Adults/Teens. Researching Confederate soldiers during the Civil War can be challenging. This lecture will be an overview of records that are available for research for the “boys in grey” that valiantly fought for the South. Pension applications for American Civil War veterans can be a rich source of information regarding their service during the war and the lives of the pensioners after the War. These records are housed in many locations depending upon the side fought for. A presentation of the records and repositories will be highlighted. These records can offer a deeper look into the individual Civil War soldier’s history and stories regarding their service in the American Civil War. Found mostly in original source documents this group of records offer a special look into the harsher side of the conflict. Once a week I drive through Houston commuter traffic to scan someone else's stuff. Today was that day. The items to be scanned are in files in cabinets. I do not know what I'm scanning until I open the file. Today I scanned a high school reunion yearbook. It had lists for each class starting with the 1890's. It was a smaller school, so the early lists had between 5-10 people. In the 1910's section, the classes included photographs with each person named in the group. Little head shots of a couple hundred people dating back 100+ years. From a genealogical perspective, this is an incredible gold mine. The next folder in the cabinet held documents pertaining to one man's military service during World War II. He was called to duty the day before his first child was born. Based on letters I previously scanned, this likely caused stress enough for his wife, and that is the very reason his child was born on that day. I was surprised at how many stamps were still in them. I recognized stamp symbols for breads/grains and fruit, but there were some I could not place. One neat item I scanned today was a letter from the man's pre-WWII employer happy that he was coming home and saying that his job was waiting for him. 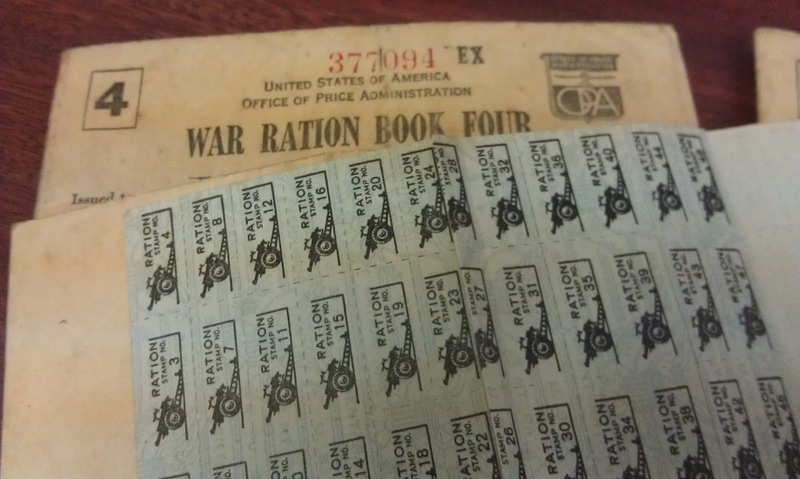 I just scratched the surface of these WWII documents today. There's still plenty more to scan in the set. What I did take away from today was a better idea of the process young men experienced as they reported for service, the paperwork required to care for the family left behind (including life insurance should anything happen) and what was needed to put all the pieces of life back together once a man was discharged from the military.